Titleist Pitching Wedge Vokey SM6 F-Grind / 48 Degree / Steel. New other as barely used! LEFT HANDED Titleist Vokey SM6 58 Wedge. M grind. Listed as new used as it has barely been used! 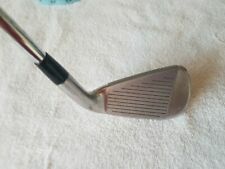 Titleist 904F #3 15 Degrees Stiff Steel Shaft Golf Pride Multicompound Grip MK. left handed Condition is Used. Dispatched with Other Courier (3 to 5 days). Dynamic Gold S300 Stiff Flex. Titleist 755 Forged Irons. 4-8 Iron (5 Clubs). 6 Iron Length: 37.5". Left Handed. Set Length: Standard. Club Details. Reference: TIIR755001. LEFT HANDED Titleist 716 AP1 Irons 4 - PW with XP90 R300 Regular Steel Shafts. Excellent condition - Probably used to play 4 rounds in total! Titleist 718 AP1 5/P Left Hand. Red AMT R-300 Regular Steel Shafts. Left Handed Titleist Vokey Design 58.08. A great wedge here for somebody looking to grab a Vokey at a cheap price. Used condition as seen from the photos but only due to loving using the club. As proven Vokey wedges are a favourite for many golfers, so grab yourself a bargain. Happy bidding. I can arrange collection if your in the area and refund the delivery. 9 Titleist Irons And Fazer Iron. Condition is Used and have signs of wear and tear. Would make an ideal set for someone starting out. Left handed clubs. Titleist Vokey design Lob Wedge, LH Good condition. Condition is Used. Dispatched with eBay delivery – Shutl 2-3 days. Titleist SM6 Wedge. LEFT HANDED. 52 Degree Loft - 12 Degree Bounce. Black Satin Finish. Golf Pride Grip. STIFF Flex (S). Titleist 716 CB 2Iron. LEFT HANDED. 18 Degrees Loft. TITLEIST "VOKEY SM7" LOBWEDGE, 58/12 D GRIND, L/HAND, BRAND NEW, GREAT VALUE !! TITLEIST "AP-1 718" GENTS L/H IRON SET, 5-GW, STANDARD SPEC, EX-DEMO, VALUE !! FOR SALE; A USED, EX-DEMO SET OF GENUINE TITLEIST "AP-1 718" GENTS IRONS. THIS SET OF LEFT-HANDED IRONS INCLUDES NO'S; 5,6,7,8,9,P GW [7 CLUBS IN TOTAL]. THE AP-1 718 IS TITLEISTS BEST PERFORMING IRON FOR THE HANDICAP GOLFER AND FEATURES OUTSTANDING PERFORMANCE WITH TOUR PROVEN LEVELS OF DISTANCE, ACCURACY AND FOREGIVENESS. Titleist 710 MB pitching wedge. True Temper Dynamic Gold S300 stiff steel shaft. Lamkin grip in good usable condition. Titleist 712 AP1 7 iron. True Temper Dynalite Gold XP R300 regular steel shaft. Lamkin REL 3rd Gen grip in good condition. Please note the chip out of the ferrule. Great condition, some light usage marks but no dings or dents etc. The shaft is perfect and the grip has loads of life left. Half and inch longer than standard. See pics for more details. Any questions please ask! Titleist 718 AP3 4 Iron LEFT HANDED AMT Black S300 Steel Stiff Flex VGC. Excellent condition! Hardly used. Owned from new. Standard length and lie. See pics for more details. TITLEIST "VOKEY SM7" GAPWEDGE, 52/08 F GRIND, L/HAND, BRAND NEW, GREAT VALUE ! Shaft Titleist. Club Type Approach Wedge. Flex Wedge Flex. Loft 52 Degree. Bounce 8 Degree. 8 Very Good Used with normal signs of light use. Introducing Titleist Vokey SM7 wedges. Vokey's Spin Milled process is unique to each finish and loft for the sharpest, most consistent groove edges. Vokey Design SM7 wedges feature a Parallel Face Texture for more consistent groove edges, tighter quality tolerances, and maximum spin. Titleist Vokey SM7 F-Grind Left Handed 52 Degree Approach Wedge. Model Vokey SM7 F-Grind. Shaft Vokey Design SM7. Club Type Approach Wedge. Flex Wedge Flex. Loft 52 Degree. Bounce 8 Degree. Shaft Material Steel. Titleist Vokey SM7 M-Grind Left Handed 56 Degree Sand Wedge. Model Vokey SM7 M-Grind. Shaft Vokey Design SM7. Club Type Sand Wedge. Flex Wedge Flex. Loft 56 Degree. Bounce 8 Degree. Shaft Material Steel. Lovely condition, some light marks on the faces from normal use but nothing major. Shafts are perfect, no issues. The grips have loads of life left. Previously used by a single figure handicap player and well looked after. 1/2” longer than standard. Standard lie. Left Handed Stiff flex steel See pics for more details Any questions please ask! MODEL:VOKEY SM7. SHAFT:VOKEY DESIGN. FACE :8 /10. HEAD:8/ 10. GRIP SIZE:STANDARD. Titleist SM6 Wedge. LEFT HANDED. Wedge Flex. 54 Degree Loft - 8 Degree Bounce. MODEL:VOKEY DESIGN SM7 / M GRIND / 08 BOUNCE. SHAFT:TITLEIST VOKEY DESIGN. FACE :8/ 10. HEAD:8/ 10. GRIP:9/ 10. MODEL:VOKEY DESIGN SM7 / M GRIND / 08 BOUNCE. SHAFT:TITLEIST VOKEY DESIGN. HEAD:8/ 10. FACE :8/ 10. GRIP:8/ 10. MODEL: AP1 716. SET MAKE-UP:4-PW (7 CLUBS). SHAFTS:8/ 10. GRIP SIZE:STANDARD. Titleist 710 CB forged 8 iron. True Temper Dynamic Gold R300 regular steel shaft. Lamkin Crossline grip in good condition. All pictures are of the actual club for sale. MODEL:VOKEY SM7. SHAFT:VOKEY DESIGN. HEAD:8/ 10. FACE :8 /10. SHAFT:8 /10. GRIP:8/ 10. GRIP SIZE:STANDARD. Titleist Vokey SM6 F Grind Raw Black Left Handed 48 Degree Approach Wedge. Model Vokey SM6 F Grind Raw Black. Club Type Approach Wedge. Loft 48 Degree. Bounce 8 Degree. 10 New Unused, perfect new condition. VOKEY TOUR VALIDATED GRINDS. The highest bounce wedge in the lineup, the K Grind is the ultimate bunker club and the most forgiving wedge in the lineup for all shots. The player’s high bounce wedge. MODEL:SM7 VOKEY. SHAFTS:TITLEIST VOKEY. LOFTS: 60° M.
MODEL: AP1 718. SHAFT:AMT RED R300. SET MAKE-UP:5-PW 48°. LEFT HANDED . LENGTH: STANDARD. GRIP SIZE:STANDARD. SHAFTS:8 / 10. TITLEIST "VOKEY SM7" SANDWEDGE, 56/10 S GRIND, L/HAND, BRAND NEW, GREAT VALUE ! **BRAND NEW** Left Hand Scotty Cameron Newport TeI3 Putter 35"
Titleist SM6 Wedge. LEFT HANDED. Wedge Flex. 48 Degree Loft - 8 Degree Bounce. SHAFT:BV DESIGN. SHAFT:8 /10. FACE :8 /10. GRIP SIZE:STANDARD.